What a pleasant surprise hidden in downtown Brooklin! I walked right by it when I was looking for it. Look for the cow sign! Grab a table if you see one as soon as you get in, because if it's busy, you won't get one! The menu is insane and I want to try everything on it. My mom and stepdad had been here once before and we dying to come back. Today we tried Southern BBQ burger with fries and onion rings. The fries were amazing. I definitely want to try a poutine. The onion rings were huge and crunchy. Mmmmmm. The burgers were delicious. So flavourful and juicy. You could really taste the smoky flavour in the bacon. Coleslaw on the burger was great; I never thought of putting coleslaw on it, but I'd do it again. Tangy with a pleasant crunch. The bourbon birch beer bbq sauce didn't over power. Need a good burger? Fast food won't cut it! 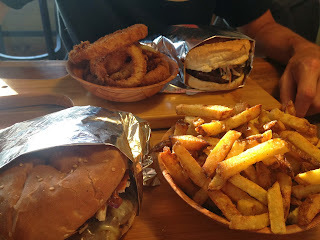 Head to Baldwin Street Burger and it will keep you coming back. I definitely want to!